"Is There No Help for the Widow's Son?" This hidden code is buried deep within the dust jacket of Dan Brown's phenomenal bestseller, The DaVinci Code. Tracing this enigma to its sources in Freemasonry, Mormonism, and early Christian apocrypha, investigative journalist David A. Shugarts was able to predict that the next Dan Brown book would be focused on the secret history of the Freemasons and set in Washington, D.C. Sue enough, Dan Brown has confirmed this prediction. 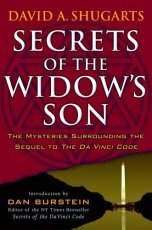 His publisher even announced the book would be entitled The Solomon Key -- a title whose multiple meanings resonate with Freemasonry, Gnosticism, occult belief, and conspiracy theory in ways Shugarts now explores in the groundbreaking Secrets of the Widow's Son. The world breathlessly awaits Dan Brown's The Solomon Key. But you need not await the mysteries, adventures, themes, and historical figures likely to appear in that book -- because now there is Secrets of the Widow's Son.